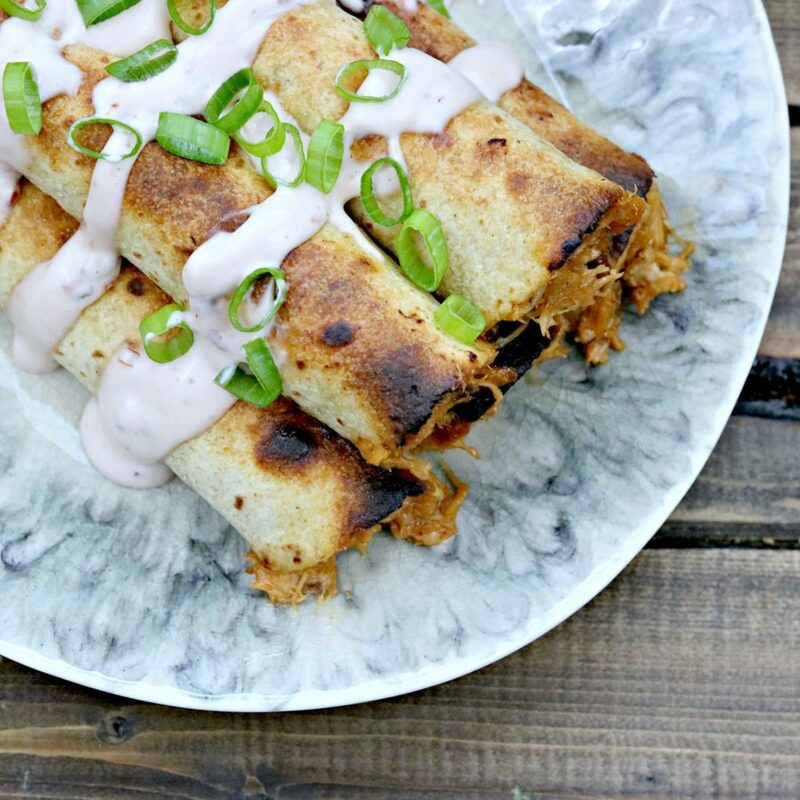 Pulled pork is smothered in a creamy raspberry chipotle bbq sauce, rolled up, and baked into a crispy, creamy taquito! Hello, friends! Feels like it’s been awhile since my last recipe post, doesn’t it? Things have been a little hectic ’round these parts lately. I’ve been really trying to get home and get dinner cooked so we can eat by 6:30 with the baby, then do bath and bedtime. That means I’m rushing around to get it all done and shovel it down my throat before bath time. Which then means there is less than no time left in there to style and take pics. And if there are no pics, there is no post. KnowwhatImean? But here I am, photos and recipe ready to share! And hopefully that means I’ll be able to get back into my rhythm and get new posts up regularly again! I recently redid the recipe index, to include pictures, which then made me realize how many of those old posts need some updating. Let me tell you how much easier that makes menu planning. Pull up the old posts, and start filling in days! Keep an eye out for those to start coming this week or next – photo time, permitting! 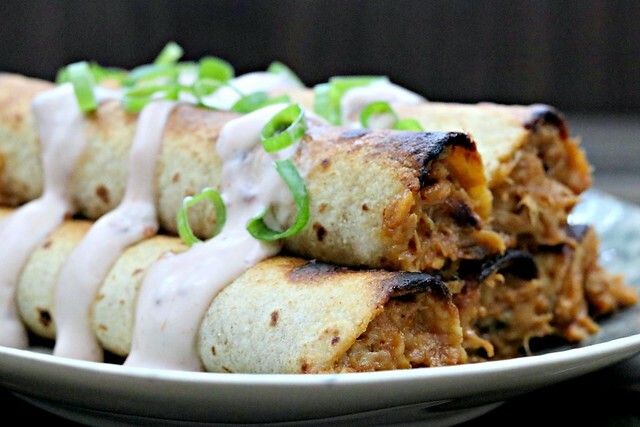 While menu planning recently and trying to think of what I had in the freezer that I needed to use up, I remembered I had some pulled pork in there, and typically I used pulled pork for tacos, taquitos, sliders, or to stuff in potatoes. 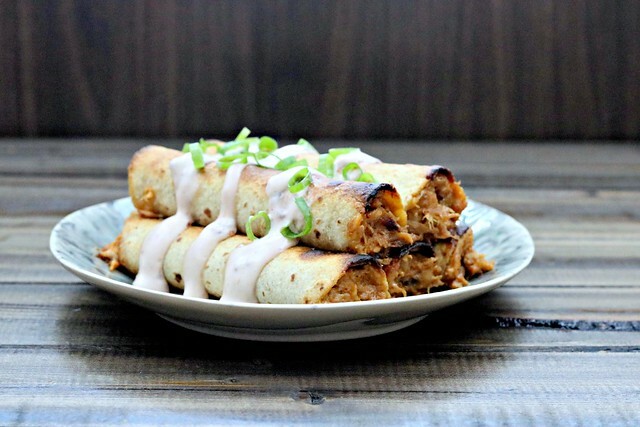 I remembered that I made these chicken taquitos awhile back and we loved them so much I figured they’d have to be just as good using pulled pork. So, on the menu they went! And in our bellies they went. Even the baby loved the pork. No taquitos for her just yet, but one day she’ll love them like we do, I’m sure! I made a nice little dipping sauce with ranch dressing, sour cream, and some of the roasted raspberry chipotle sauce. Deeelish! The creamy raspberry chipotle bbq sauce really is what this is all about. I mean, the pulled pork is great, but…it’s really just a vehicle by which to shovel the sauce to your mouth, if we’re being honest here. I’m thinking shrimp is quite possibly the next thing to try. But you – you need to try these (or the chicken version) ASAP. Slow cooker meals are great, but when you have leftovers to use up from previous slow cooker meals, and all it takes is mixing up a sauce, stirring things together and then rolling it up in a tortilla to bake for 10 or 15 minutes – well, how could that not be the perfect weeknight or on-the-go-busy-family meal?? Trust me. You want these. Tonight. When done, shred the pork with two forks, or remove to a stand mixer and shred with the paddle attachment. Stir it with remaining sauce in the crock pot and allow to cook for an additional 10-15 minutes. 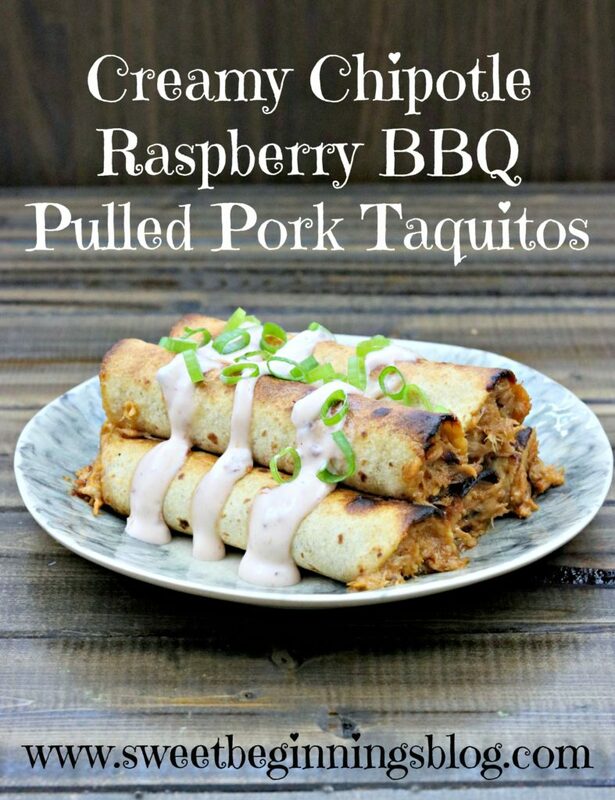 ** This is also a good way to use up leftover pulled pork, just skip the slow cooker step, mix the sauce ingredients, combine with pork and the assemble the taquitos.